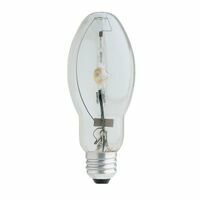 Clear Metal Halide lamp, 175 watts, ED28, with mogul (E39) base. 10,000 average life hours, 4000K, 9.25"H.
Metal halide general lighting clear lamp, universal operating position. 4000K color temperature, 65 CRI. 15,000 horizontal and 20,000 vertical operation average life hours. Metal halide medium base 70 watt PULSE START, clear finish E17 bulb, universal operating position. 75 CRI, 3,000K color temperature. 3400 mean lumens, 10,000 horizontal and 15,000 vertical operation average life hours. Boxed.